ABC's Scandal is one of my guilty pleasures. While I am a cord-cutter and cannot partake of TGIT social media activities, I am all about the TGIT fall lineup on Friday morning. 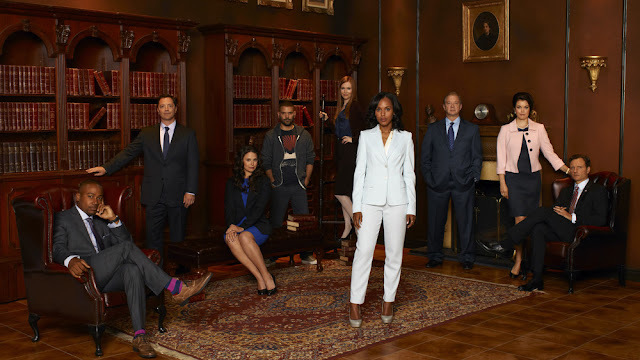 So I am glad to be able to write a little post about Scandal season two, episode 10, "One for the Dog". The events within "One for the Dog" follow the attempted assassination of President Grant (Tony Goldwyn). Huck (Guillermo Diaz) is being interrogated/tortured at the Pentagon as the only suspect for the assassination attempt. First Lady Mellie Grant (Bellamy Young), has forged her husband's signature to have his presidential authority reinstated. The problem, aside from her forgery, is that POTUS is still in a coma. Acting president, Vice President Sally Langston (Kate Burton) and Hollis Doyle (Gregg Henry) so not believe President Grant is awake yet. OPA has taken on President Grant as a client. Olivia Pope (Kerry Washington) is working hard to convince the country, after Sally leaked the reinstatement document to the press, that the president is awake and on the job from his hospital bed. David Rosen (Joshua Malina) is present during one of Huck's interrogations. Huck asks David is the president is still alive. David advises him the president is indeed alive. Huck advises the president is still in danger and the she, Becky (Susan Pourfar), will try to finish the job. David pays attention to this while the CIA dismisses the importance of what Huck has said and just wants to keep beating someone up. Olivia gets Sally to have Huck release. A plot is established to set "Becky" up knowing she will try to kill President Grant again. "Becky" is caught and tells Huck that her real name is Katie. President Grant wakes up by the end of the episode. His waking up stops Sally from taking over again and saves Cyrus' job as Chief of Staff. One of the first things President Grant does is have Cyrus call Olivia to let her hear his voice. Now there are other things that happen in the episode that relate to a continual story that spreads across seasons. The underlying theme or "scandal" across most of the season is the love-affair between President Grant and Olivia. Throughout the series, you see how this affair ties into a lot of things throughout government. Affecting it positively but mostly negatively. You can watch Scandal, including "One for the Dog", on the ABC app and Netflix.